Join us for an opportunity to volunteer and keep your neighborhood Beautiful! It’s the right time of the year to cut down the cattails from the pond; it’d be great to get the canoes again. 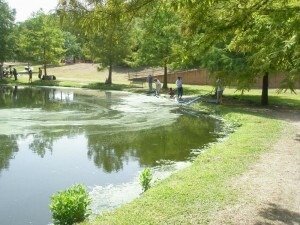 Other volunteer opportunities include: Painting, brush removal from rock wall on west side of pond, trash pickup, edging around pond, removal of debris from island. Cleanup starts at 9:00 a.m. We plan on finishing by 1:00. For more information about Sunday’s clean up contact ms [Email address: ms #AT# weareteachers.com - replace #AT# with @ ]" target="_blank">Malcolm St. Romain. See you Sunday!